Mass Sea files are signed by Course Blue, which is probably a fictitious company name, based on the fact that you cannot find any information about it. This suspicious application was categorized as adware because it could connect to the Internet without your permission and display unreliable ads while you browse. You might want to stay away from such content as it could redirect you to harmful websites. Under these circumstances, keeping the adware could be a bad idea, and that is why our researchers think that it might be best if you erase it. Users who have no idea how to delete the software can learn from the removal instructions available below the article. If you want to make sure that there are no other suspicious applications on your computer, you should do a full system scan with a reliable antimalware tool. It does not matter what browser you use; the application can display advertising on Internet Explorer, Mozilla Firefox, Google Chrome, etc. The adware uses the Internet without your permission to connect to masssea-a.akamaihd.net and load advertisements. What's more, ads shown by Mass Sea might have indicators that separate them from other advertisements, e.g. “Powered by Mass Sea.” These ads should belong to the third party, so they are not related to the software or company that developed it. Naturally, the adware’s creators do not take any responsibility for any harm that might happen while you interact with third-party ads. The reason why Mass Sea might gather data related to your browsing habits is because it makes it easier to understand what advertisements should seem irresistible to you. In other words, their goal is to present ads that you would be tempted to click. 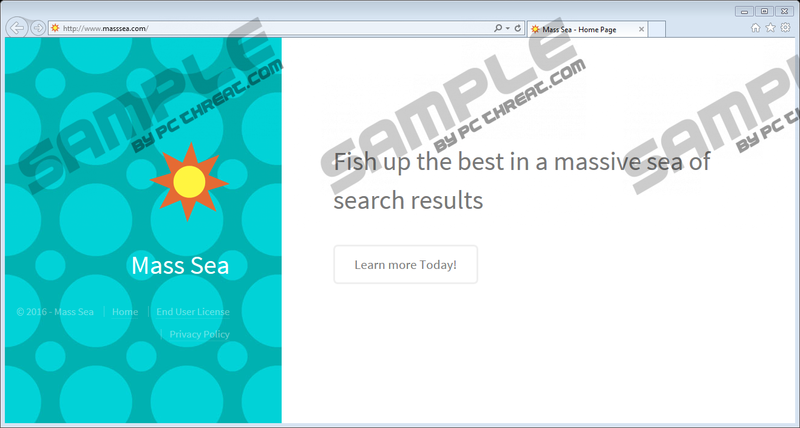 It could be that the adware’s developers earn a particular amount of money per click from its third-party partners. It’s a trade that is beneficial both to the adware’s creators who could receive advertising revenue and to the third party that might be able to increase their web pages’ traffic or popularity. The main problem is that this scheme is not beneficial to users. You could be flooded with irritating Mass Sea pop-ups and other ads that could not only slow your browser, but also lead you to harmful web pages. For instance, an ad that offers you to download free software or updates might redirect you to a site, which contains malware. Also, some of the sites could suggest various freebies for a particular private information. It might seem like a fair exchange, but before you reveal your sensitive data, you should always find out why it is required and how the site is planning to use it. There are cases when untrustworthy web pages collect private data, such as email addresses, telephone numbers, various passwords, and so on. This information could be sold to any other interested party or used for cyber fraud. The Internet is full of ads, and if you do not wish to see more of them than you have to, we advise you to remove Mass Sea. The application is a worthless adware that does not have any other functions besides showing irritating pop-ups, coupons, full page ads, and so on. Thus, if you want to delete it, take a look at the instructions below as they will tell you how to uninstall the program via Control Panel. If you wish not only to eliminate the program, but also ensure that your computer will be protected from such threats in the future, you could install a reliable antimalware tool. Choose Control Panel and select Uninstall a program. Find Mass Sea, select it and press Uninstall. Quick & tested solution for Mass Sea removal.